There are times in life when we have to take critical decisions not because we want to, but because we have to. This is the present condition of things in Nigeria for the different ethnic groups that make up constituents of the country. The recent events in the country leaves us with huge food for thought. Since independence, the story of Nigeria has never been positively interesting. The late literary icon, Prof. Chinua Achebe recounting the events of the year 1966, six years after Nigeria's independence and three years of Biafra's nationhood, said: "l simply could not bring myself to accept that l could no longer live in my nation's capital, although the facts clearly said so. My feeling towards Nigeria was one of profound disappointment. Not because mobs were hunting down and killing innocent civilians in many parts, especially in the North, but because the federal government sat by and let it happen." (Culled from 'There Was A Country'. Pg. 71). Fifty years on and we are still at the same crossroads witnessing the same old scenario that brought about the disintegration of the once British colonised entity. It was Sunny Okosun who once sang: "Which Way Nigeria," which way to go? This was the clear picture of Nigeria then, now and tomorrow. A picture of a confused and lost country. Lacking vision, purpose and good prospects for its citizens. Many factors can be responsible ranging from the stupidity of the ruling class, the foolishness of the religious bigots, the blind enthusiasm of ethnic suspicion and mistrust, high illiteracy of literate class, gross illiteracy of the illiterate class and chiefly the amalgamation of incompatible ethnic nations. If after over fifty years, Nigeria cannot boast of achieving the fundamental dreams of the independence fighters/fathers, it means that either there were no dreams at all, or the dreams are forgotten or it was a nightmare and not dreams at all. Nigeria in its near 58 years cannot confidently single out a year without ethnic or regional tension and bloodbath. This suggests that Nigeria was never meant to be, not a nation or a state. The problem of Nigeria is a foundational issue, some may call it structural problem or imbalance. The Bible rightly said: "Foundation once destroyed, what can the righteous do? (Ps 11:3)". A forced marriage as in the case of Nigeria, that lacks good marital foundation called love, only breeds mistrust, misunderstanding, battering, marginalization, infidelity, constant suspicion and the worst being death which can best be resolved through divorce. The same is the condition of Nigeria and its amalgamation. The marriage of the over 250 ethnic groups was forced and borne out of selfish interests of its creators not out of love or desire to see the constituent nations progress. The consent of the individual ethnic groups was not sought by the colonialists and creators of Nigeria. This is why it is today, a messy, failed marriage due for breakup or divorce. The bloodbath, mindless killings, tensions, ethnic crises and genocide/cleansing are only but symptoms of the real disease - incompatibility. This is the killer disease decimating Nigeria and shredding her into pieces today. No matter the curative approaches, it has continued to fester and deteriorate due to wrong diagnosis and administration of ineffective and impotent curative measures. The disease is surely not incurable, no, only that the wrong medication is being prescribed whereas this disease has only one authentic medicine - secession/divorce/separation via the instrument of referendum. Until we genuinely apply this cure, just as couples in a forced marriage continues to have difficulties, so will the Nigerian problems continue to persist. The bloodbath in the Middle-Belt is not only a repeat of history, it is also a sign of greater danger to come. Nigerians need not be told that time is now ripe for division into separate sovereign nations. When children come of age in my culture, parents allow them to go and form their own families. This is the meaning of independence. In case of battering in marriage, the couple are separated to save lives and not forced to live in peace. Anything artificial (inorganic) remains artificial. Nigeria should quit forcing or shoving unity down our throats. My clarion call to the Biafrans and well-meaning Nigerians is for all to wake up and shake the foundation of Nigeria to see the artificial stuffs it is made up of which is detrimental to our safety and progress as a young generation who has found themselves in such eureka moment in life. It is time to confront the Nigerian reality with the truth. It is only the truth that will save us. The Nigerian polygamous marriage called the Nigerian project is a total flaw right from its foundation. No amount of cosmetic decoration will save a failed project. Hence, we need to revisit the foundation to separate the incompatible ethnic groups, so they can be able to decide their future on their own without undue external interference. 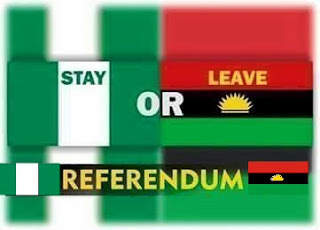 This is the only remedy and it begins with the Biafra referendum.